Jim has been preaching at Meridian Woods since February 2009. 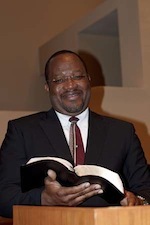 He has served in full ministry since 1981. Jim and his wife Marjorie lived and ministered in Jacksonville for 22 years. He spent six years in Chattanooga, TN before coming to Meridian Woods. He is a graduate of the University of Florida and completed graduate work at Luther Rice Seminary with a M.A. in New Testament Studies. He is the father of two children who reside in Atlanta, GA. He is a proud grandfather of three. Jim loves God, restoring old cars, fishing, and spending time with family. Melanie Nickeo has been a member of Meridian Woods Church of Christ, since she was a young girl. In February 2016, she began serving as the Children’s Ministry Director. With a desire to teach a Bible-based curriculum, Melanie encourages a biblical-based lifestyle, amongst the children. She, along with her husband, Jae, have three children (Jayla, Jailyn and Jaeson). Melanie loves to spend time with her family and enjoys baking in her spare time. Fitting the perfect mold of a Church Administrator is Melinda Singleton, who has served in this position for over twenty-five years. In this capacity, Melinda is the hub for all things administrative within Meridian Woods Church of Christ. She ensures that the office runs efficiently, as she assists the Ministers, Elders and Members of the body with their needs. From the first moment you meet Melinda, she will make you feel welcomed and special. This is particularly important as Meridian Woods reaches out to community.